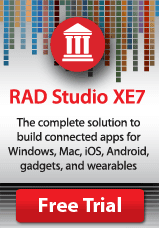 Download and activate your RAD Studio XE7 or Dephi XE7 trial and get Coding in Delphi by Nick Hodges for free. 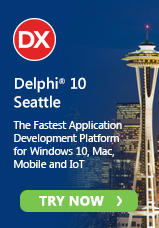 By activating your trial, you will receive a free copy of Coding in Delphi. This ebook covers a variety of powerful Delphi programming features and techniques including Generics, Interfaces, Exception Handling, Anonymous Methods and more! How to get it: Download, install and activate one of the following trials. After activating your trial, click here to download the ebook.